Crossing through the cacophony of progress in our shining desert Metropolis, we waver and stop to witness a modern utopic vision surrender to a dystopic fate. A monument to man’s technological advancement has been mysteriously abandoned to time and left to seed. In its place, a monument to nature grows out of its fertile ground. The angular black steel roots of modern computer circuitry in the shape of a stepped pyramid give way to the ancient roots of a sacred Bodhi tree, as it reclaims this relic of our Future’s Past in its embrace. 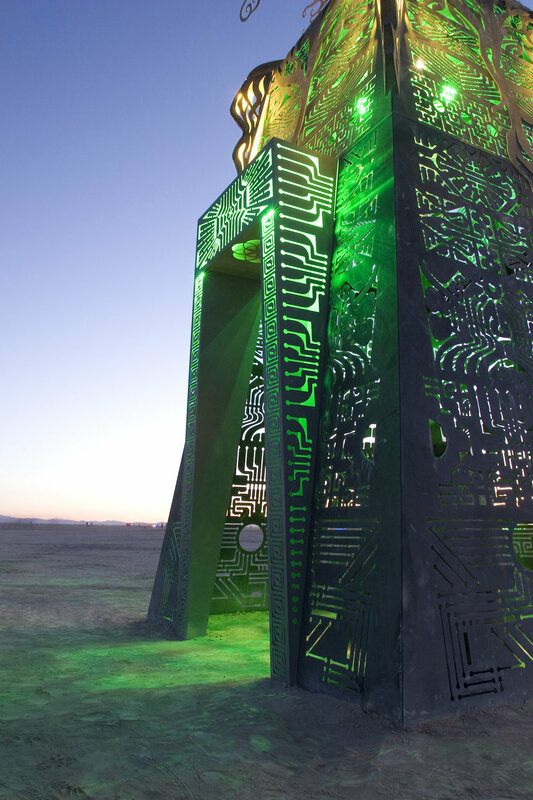 Future’s Past was commissioned by the Burning Man event in August 2010 in the Nevada desert. The theme this year was "Metropolis: The Life of Cities". I chose to address the concept of modern development by creating a cautionary tale of collapse. Future’s Past is a modern ruin, an architectural artifact found in the future. Once built as a monument to technological progress, this pyramid of system circuitry has been abandoned through unchecked consumptive collapse, but reclaimed by the resilience of natural forces, and evolved consciousness, symbolically represented by the roots of a sacred Bodhi tree, a symbol of Siddhartha’s seat of enlightenment, and our own. Taking inspiration from explorations of lost civilizations akin to the pyramid temples at Chichen Itza (Mayan Peninsula, Mexico) and the massive root systems of the trees at Ta Prohm temple (Angkor, Cambodia), this tree both supports and consumes the immortal archaeological efforts of mankind with its slow-motion grip that both crushes and buttresses the temple walls. These collapsed civilizations of the past have much to teach us through their failures of ecological sustainability and the mercilessness of nature. Yet, in this sculpture, the conjunction of the tree and the pyramid symbolize more than just the evolution of nature trumping the machinations of man. Future’s Past is a symbol of the human evolution of consciousness triumphing in our precarious modern developmental struggle. This we also know: Action-- or inaction-- in this face of global change is the fulcrum on which the survival of a species rests. To be an active participant in the present moment is the only way to shape what is to come. Our Future’s Past is now. Future’s Past exists in 2 spheres: the circle of the tree trunk meets the square of mans earthly creation. The 12’ black steel pyramid is a nod to the past great civilizations and echoes the architectural form of a renowned collapsed culture: the Maya. The structure is instead made of a digital lace, which crawls and wraps around the four walls, filtering light in layered angular moiré patterns of movement. A doorway made of silver three-dimensional hollow walls lights the entryway to an 8’ x8’ interior. 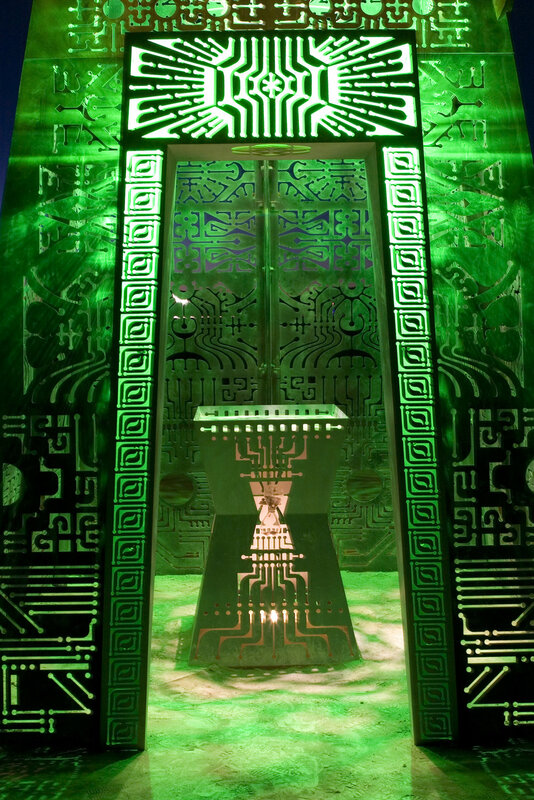 A surreal, archaic altar exists inside, as if a survivor of this future’s past civilization had no gods but computers, and so set up a little offering inside the temple: a black sand hourglass marks the passage of and era -- and the present moment -- by the most primitive mechanics possible. Overhead, a seven layer aerial aluminum "Seed of Life" aerial sculpture descends from the space above. Symbolizing the digital roots of the Bohdi Tree above it, the interlocking circles form an ancient sacred geometric shape that is said to symbolize the blueprint of creation. Illuminated in white spotlights, the aerial sculpture is reflected in the mirrored surface of the altar’s table below it, visually compressing the 7 layered sculpture above into a mandala of reflective silver and green circles of light. As a contrast to the world below, the entire 11 foot Bodhi tree is symbol of enlightenment from earthly attachments, and a study in curvilinear organic forms. The branches reach up and they curve out, each of the 4 roots grip the corner edges of the top platform, accentuating their wiggly forms in opposition to the angular structure below. The tree has been designed as if it were a wise sentient being, watching the chaos below with eye-like branches. Visitors are invited to lounge in the curving root systems, above the darkness of the pyramid below.